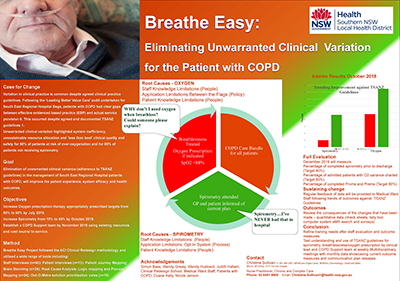 The Breathe Easy project aims to eliminate varying treatment outcomes and clinical uncertainty for patients with exacerbation of chronic obstructive pulmonary disease, admitted to South East Regional Hospital in Bega. A project to implement a shared mortality and morbidity clinical review process across four small rural health services in northeast Victoria. The project includes development of standardised tools and the formation of a collaborative clinical review forum to help address the common risks experienced by patients in care at small rural health services in the region. St Vincent’s Hospital Sydney (SVHS) improved patient information, treatment procedures and staff education, to ensure the placement of gastronomy feeding tubes aligned with best practice and Agency for Clinical Innovation (ACI) guidelines. 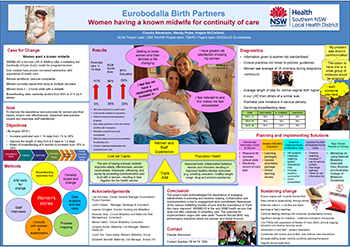 This project addressed barriers experienced by nursing staff when using the malnutrition screening tool, by introducing staff education, streamlined education pathways and a cheat sheet for nursing staff. This project measured the appropriateness of eye care delivery in NSW, by developing clinical indicators and conducting an on-site record review of up to 40 optometry and ophthalmology practices across the state. The seamless, person-centred Electronic Chest Pain Pathway (eCPP) was developed to be compatible with all other pathways. It provided continuous care for patients with deteriorating health and developed key partnerships between the project teams that co-designed the easy to use evidence based tool. Stepping Home with Cellulitis results in reduced length of stay for patients admitted to RNSH with Cellulitis through implementation of a clinical pathway.